Saint Patrick's Day celebrated at the Renaissance Festival is one of many modern celebrations that have been greatly influenced by those of the Irish diaspora, particularly those that developed in North America. 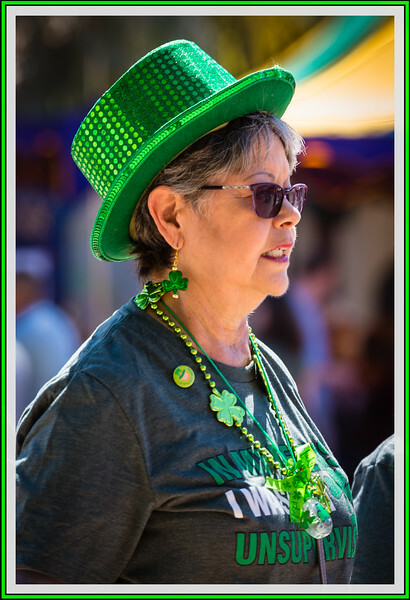 Celebrations generally involve public parades and festivals, traditional Irish music sessions, and the wearing of green attire or shamrocks. How could anyone miss St Patrick's Day ... Fine portrait !! Awesome shot for St. Patrick's day! She is clearly totally into the occasion. All dressed up and ready for the day! Great accessories in green. Great portrait, especially for today.